With this classic AP chemistry experiment, students predict the outcome of stressors. Le Chatelier’s Principle is a qualitative rule that allows the prediction of the effect of temperature, pressure, and concentration changes on chemical reactions. The principle states that a chemical system at equilibrium, when stressed by external forces, will adjust to minimize that stress. For example, when a system is subjected to increased pressure, it adjusts so it will occupy less volume. This offsets the pressure increase. If ice is placed under an increased pressure, it melts because the water obtained from a given mass of ice occupies less volume. In the formation of ammonia (the Haber process) from hydrogen and nitrogen, the product of the reaction (NH3) occupies less volume than the two uncombined gases. The increase in pressure favors the production of ammonia. This experiment is divided into three separate reactions demonstrating how different types of stress affect equilibrium. Students predict the outcome of each situation and then prove or disprove their predictions. 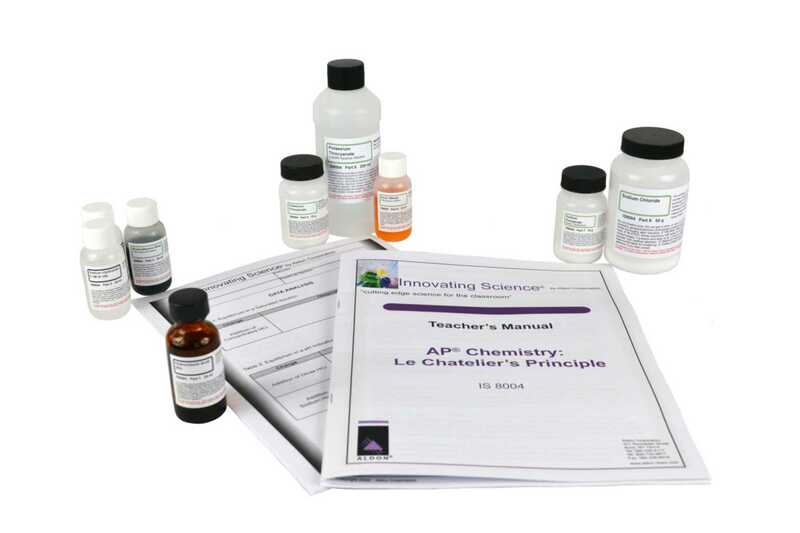 Ordering information: This kit includes bromothymol blue pH indicator solution, potassium thiocyanate, ferric nitrate solution, potassium thiocyanate solution, sodium phosphate, dibasic, hydrochloric acid, sodium hydroxide solution, and sodium chloride.